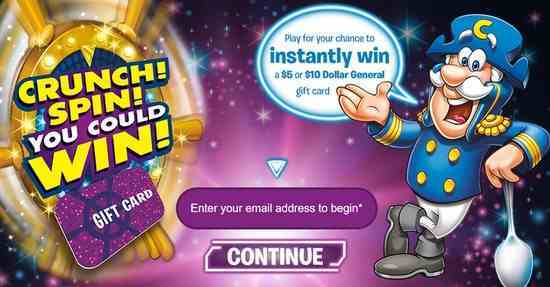 Play Quaker Cap’n Crunch Spin You Could Win Instant Win Game at crunchspintowin.com for your chance to win $5 Dollar General Gift Card (3,750 Winners) and $10 Dollar General Gift Card (250 Winners). One Person can play 5 times per day during Sweepstakes Period. All the Best!